The scientists published their findings in the journal Nature Neuroscience¹. 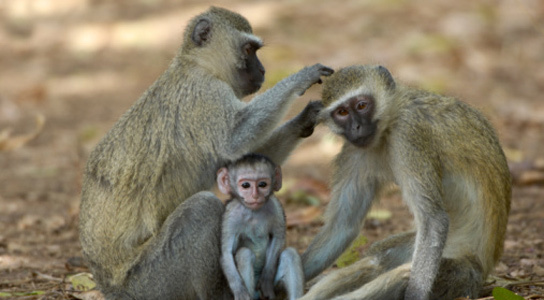 They used electrodes to directly record neuronal activity in three areas of the prefrontal cortex, an area that is known to be involved in social decision-making while the monkey performed reward-related tasks. When the monkeys had the choice to drink juice from a tube for themselves or give it to another, they would mostly drink it themselves. However, when the choice was between giving juice to a neighbor or neither monkey receiving anything, the monkey would often choose to give the juice to the other. The researchers found that in two out of the three brain areas being recorded, neurons fired in the presence or absence of the juice reward only. By contrast, the area known as the anterior cingulate gyrus responded only when the monkey allocated the juice to the neighbor and observed it being received. The scientists suggest that the neurons in the ACG respond to and record the act simultaneously. The ACG is known to be a region specialized for social decision-making in primates, and it is located in the same area of the brain as that associated with the generation of feelings of empathy in humans. Whether the ACG operates in a similar fashion in humans hasn’t been demonstrated yet, but the authors suggest that the intricate balance between the signaling of neurons in these three brain regions may be crucial for normal social behavior in humans, and that disruption may contribute to various psychiatric conditions, including autistic spectrum disorders. Chang, S. W. C., Gariépy, J.-F. & Platt, M. L. Nature Neuroscience dx.doi.org/10.1038/nn.3287 (2012). 1 Comment on "Area of Monkey Brain Keeps Tally of Altruistic Acts"
Social decision in living beings is a common one. We can see the behaviour in crows also when they find food, they cry to their friends to share the same. ACG response in the brain is a common one. But in humans it is not working because of suppression of neuronal firing by us in order to be greedy of having the reward kept to ourselves. The only greediness in animals is the territorial behaviour to protect their living territory and it will not enlarge to other spheres of social activity. By the by maximum area in our brain is reserved for operation of our fingers and thumb for which task we are adapted to live. Thank You.